Straight up through overlap then onto easy slab that protects with good Camalots in breaks. Take a full range of sizes from small to large. Daniel Joll, Erika Tovar 2011. Start 5m left of Angel Cakes under small roof. 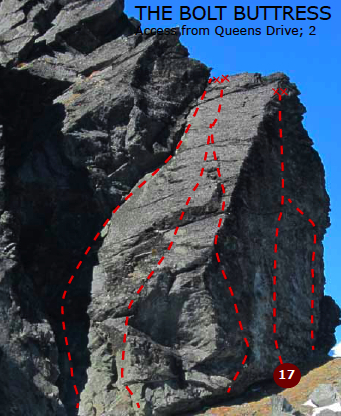 Move up and right then back left to gain a crack near the arête. Continue up this and then cross the arête onto the slab of McFanny Goes Top Roping. Be careful not to fall off before you reach the first placement. Equipped with 5 bolts and gear to #4 Camalot. Climb to bolted belay at the top of buttress. Al Uren, Wayne Marshal 2010. Equipped with 5 bolts & natural gear. Another good traditional project bolted for the masses. Bolted & cleaned by Al Uren. Start up the crack with a few bolts then head left to join up with the top of Angel Cakes. Start as per any of the previous routes and continue up the easy ridge to the summit ridge of the Telecom Tower.